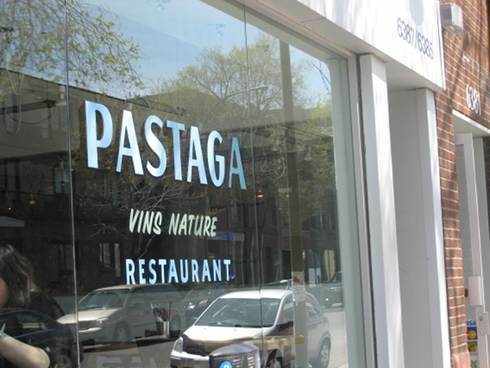 Pastaga offers a very democratic price for what you get. 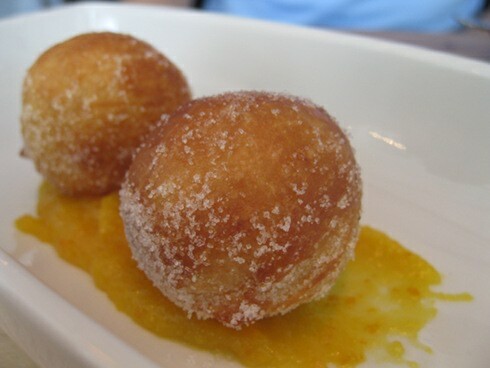 The minute we finished placing our order we were treated with complimentary dough balls or mini donuts / timbits. They came with a lemony sauce and it worked wonderfully with the already warm and moist bread. 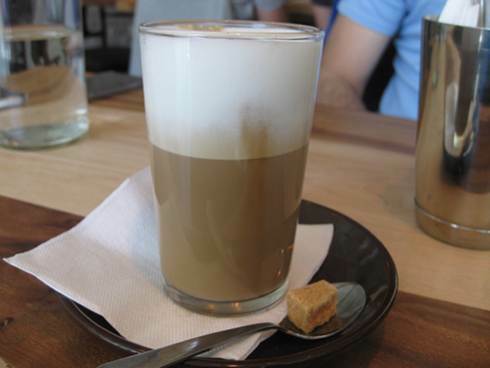 This was a nice light refreshing start to our meal and was added value to our dish since it was complimentary. We also had a fruit drink ($4) which, in all honesty, we ordered at the end of the meal. There’s a lesson here and skip ahead a few lines if you don’t want to read it but here it goes: when a menu has an item called tropical juice and has no description on it, I will skip it. 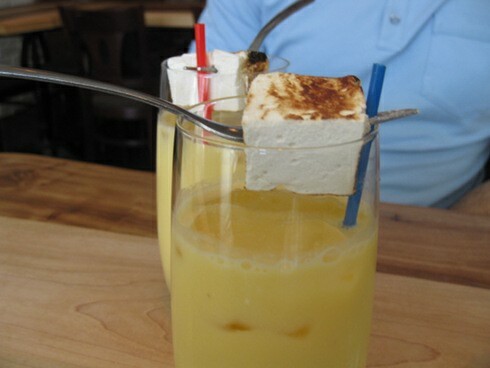 However, when I see this wicked cool drink with a roasted marshmallow cube on top then I will order it. Why? Because it’s cool and it’s only $4. I spend more on parking so a splurge on something that looks cool was in order. An added bonus to this is that it tasted good. The marshmallow wasn’t mushy or too hard. I ended up dipping it pre bite and post bite and the drink itself was refreshing as well as a good amount for the price. As a foreword, my friend works out…. a lot. He also follows a paleo, no carb diet which he broke for me that day. He’s also a foodie and willing to try something new and good. So, he went for the most paleo friendly dish which is the marinated salmon with poached egg, bagel chips & cream cheese with herbs ($14.50). The presentation of the dish was impressive. 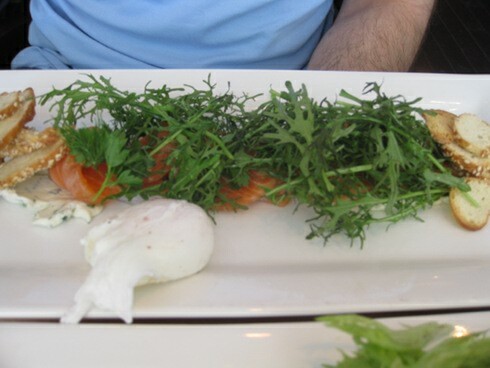 There is a base of salmon flanked by two mounds of bagel chips, topped with greens and a poached egg off to the side. The salmon was incredible! The bagel chips around it were fun and unique, something I had not see before and the poached eggs was perfectly done. The greens were a tad much and not all finished. Overall, the dish itself was not incredibly filling. The taste and presentation scored points but this is not an option for those who are famished. Let me be doubly clear: the plate delivered in taste and presentation and you should try it but, if you train 6 times a week and are hungry every minute of the day, this is not your dish. The next dish was the smoked bison Benedict ($15) which is two poached eggs on an English muffin with smoked bison and a light sauce. This dish is truly unique. I love the twist they did on an eggs Benedict but keeping the English muffin was perfect the eggs were poached to perfection. The sauce, as it should be, was light, tasty and was the perfect choice to this dish. 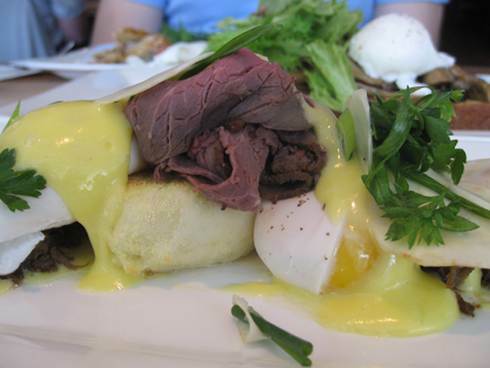 Not to mention, the smoked bison created an amazing flavour that holds up to any other unique spin to eggs Benedicts out there. This dish was more filling than the previous one as the portion of smoked bison was quite fair. This dish is fun, filling and one of a kind. And, although it may a little more than other eggs Benedict you get elsewhere, the sheer creative energy that goes into this and the taste make it well worth that little extra. Since we were feeling all adventurous, we ordered a third dish at the onset. We wanted to go crazy and share something on the menu we would normally not try. That selection was the brioche bread with mushrooms ($15). 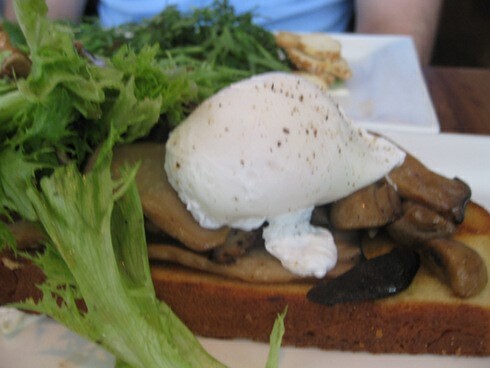 This dish came with a poached egg, bread and loads of mushrooms, and when I mean loads, it’s an understatement. There were just so many and not tiny ones, but good sized ones that offered a nice consistency and went well with the bread and the sauce which we would dip it in. Now that we had three dishes we still had space for a dessert of sorts and we went back to the menu and chose the pancakes with chocolate a compote of banana and chantily cream ($12). This was the most filling dish on the menu by far and the cheapest. The chocolate was thick and almost fudge-like. 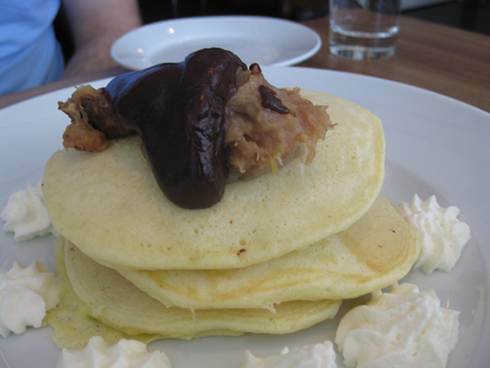 There was a generous amount of chocolate and the banana compote was ample and found in between each layer of pancake. The chantily was on the side of the dish so you could scoop it up and add it to your bite of chocolate, banana and pancake. Our waitress was very helpful and she checked up on us often and offered detailed descriptions of the dishes we were interested in. Most of the items here are vegetarian friendly. There are some dishes with fish in them but still as a vegetarian you have choices. I wouldn’t say that there’s vegan or gluten free options since bread, dairy and eggs are rather prominent in the menu. 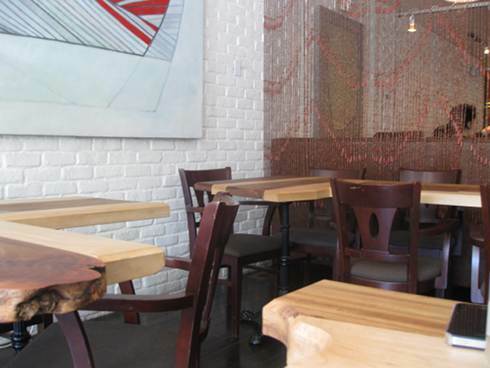 I really enjoyed the creativity and taste at Pastaga. The prices come out to a little more than at most places but when you adjust for the fact that it is not a normal place and that you get something rather creative, it is justified. The taste of the dishes was quite impressive. If you have a large appetite choose carefully and ask the staff for what is the most filling. Do expect the menu to change while some items may stick around, others will be replaced by something new, which is what makes coming here fun. I’m originally from San Francisco and have recently moved to Montreal. I was wondering if there was any good brunch places that serve great pancakes. Seems to be difficult to find a place that has buttermilk pancakes. Better yet how about a place that has either ricotta and/or cornmeal pancakes?